I may have mentioned a time or two about how much I truly love the Instant Pot. It’s just one of those inventions that are truly a game changer. And honestly, I’ve yet to find anything that I can’t cook in the Instant Pot. One of my new favorites is the Instant Pot Chicken Taco Soup. And seriously, it’s so darn easy and delicious. Oh, how times have changed…back in the day. It would take a good portion of the day to cook and make Chicken Taco soup that was hearty with the perfect blend of all the flavors coming together. Now? This recipe literally only takes 10 minutes. 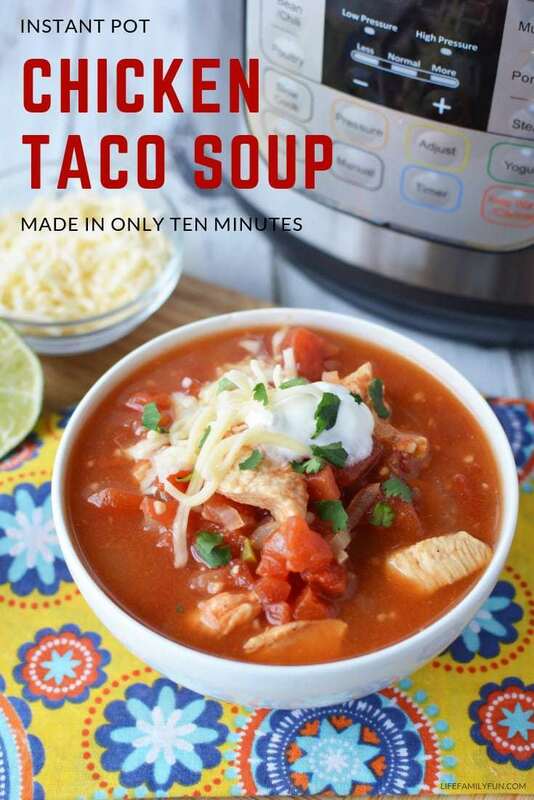 If you are wondering how it’s possible to make delicious Instant Pot Chicken Taco Soup from start to finish in 10 minutes, some things are just meant to be a wonderful mystery. The truths of this recipe remain that the flavors are wonderful, the chicken is tender and juicy and the bowls seem to be emptied as soon as they are filled. I buy a lot of my meats from Moink. Moink is a monthly meat subscription service, where you can select one of four “meat box” options and they’ll send the meats fresh to your door. Their selection of meats are are from farms where the animals are raised responsibly, meaning they’re non-GMO, and “ethically sourced.” Everything is customized online and you can create a delivery schedule that works for your family. 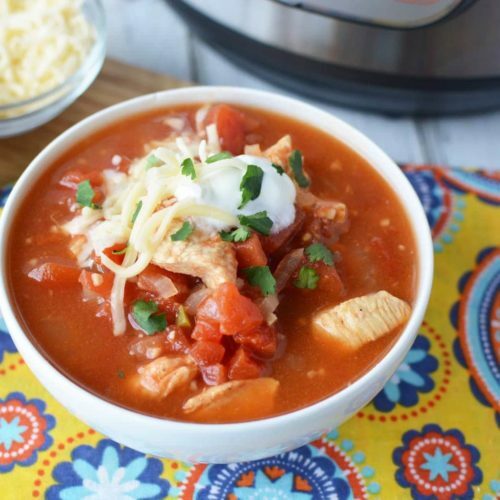 For my family, this is our new go-to Instant Pot Chicken Taco Soup Recipe, without a doubt. 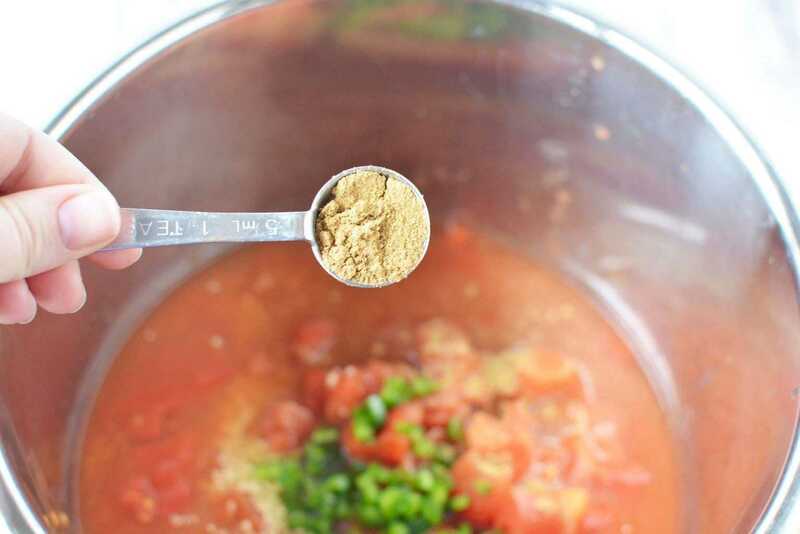 Place tomatoes, jalapeno, broth, spices and chicken into the Instant Pot and mix well. Place the lid on the instant pot and seal shut. Close the pressure release valve. Set the instant pot to manual, high pressure for 10 minutes. Quick release the steam. Open the pot and squeeze lime juice into the soup and mix well. Serve with chips, shredded cheese, sour cream and fresh cilantro. 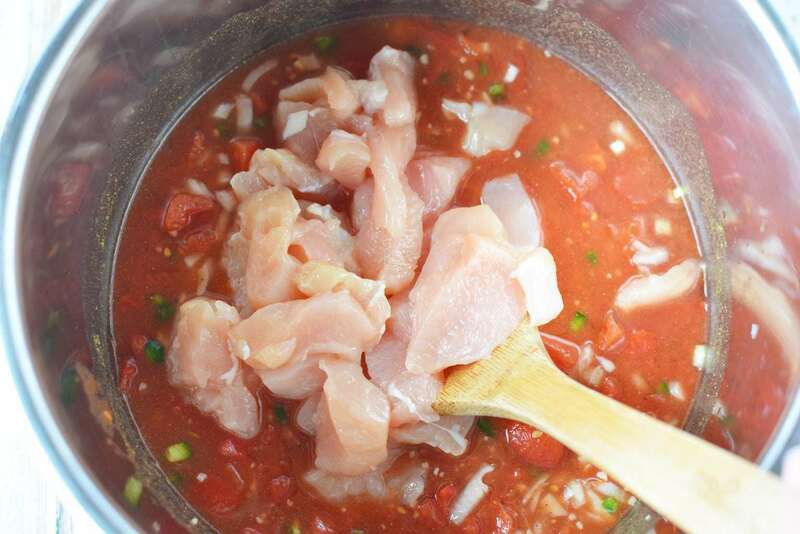 Place tomatoes, jalapeno, broth, spices and chicken into instant pot and mix well. Place the lid on the instant pot and seal shut. Close the pressure release valve. Set the instant pot to manual, high pressure for 10 minutes. Open the pot and squeeze lime juice into soup and mix well.